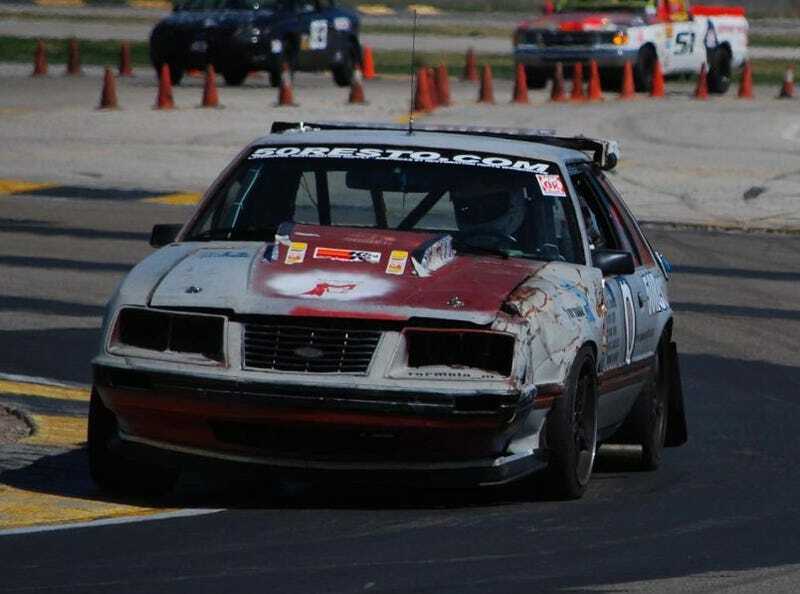 For the first time ever, Detroit iron dominated a 24 Hours Of LeMons event, with American-built machinery taking four of the top five positions (if you consider a California-built Corolla to be American-built, that is). We saw plenty of the usual LeMons suspects at MSR in Houston last weekend, with 10 Mustangs, 6 RX-7s, 6 E30s, 4 CRXs, 4 Neons, and 4 Miatas showing up, but we also had our first-ever Infiniti Q45, a pair of Toyota pickups, an Opel GT, and an MGB-GT (which managed to get around the track startlingly quickly, in between lengthy jail sentences in the Penalty Box). In addition to Mustangs coming in first and second, we saw some other world-turned-topsy-turvy events. How about a LeMons race in which four Saabs enter… and all four are still running at the end? 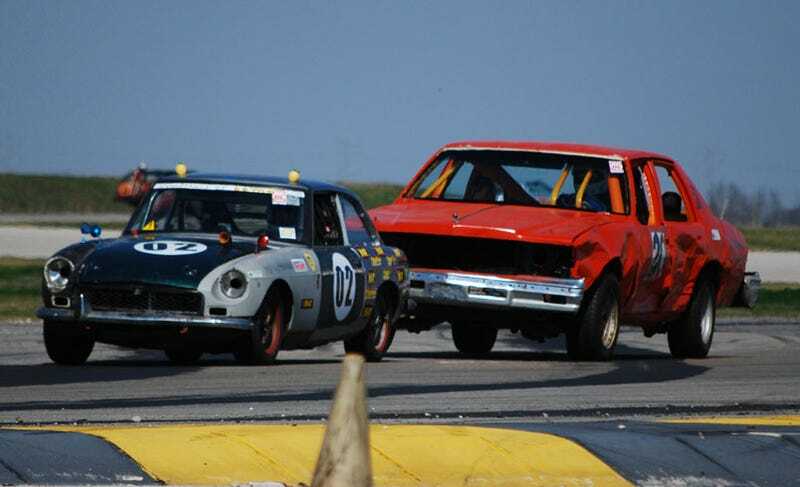 Sure, all the Saabs earned the new-for-Houston punishment for hitting tire walls and/or cones (old tires bolted to the car's roof), but they didn't throw rods or send major suspension components skittering off into the weeds in the first 30 minutes of the race! A four-banger Mustang finished second, a Saturn came in third, an 80s Dodge Daytona managed to contend, and the majority of BMW E30s raced for two solid days without exhibiting the usual maddeningly undiagnosable electrical woes (blown head gaskets and axle failures, certainly, but we didn't see the all-too-common cruel drama of E30 crew members weeping over multimeters and wiring diagrams). This time I'm going to include each team's best lap time, so y'all can see for yourselves how "fast" does not equal "win" in the 24 Hours Of LeMons. Those of you contemplating horsepower-enhancing cheats would do well to note that the four-cylinder Mustangs performed just as well as their V8 siblings, and you Miata and E30 guys can go ahead and keep thumping your chests about those absurdly quick lap times… but remember, your favorite cars got stomped by a Saturn! Those of you wanting obsessively complete lap info can go here; keep in mind that a few cars may be showing too-low best lap times due to having taken what the corner workers dubbed the "Neon Bypass" (in honor of the oft-penalized Blueballs Neons) off-road shortcut around the chicanes. Zerin Dube, editor of Speed:Sport:Life volunteered for judging duties at the race, and he also did a good job covering the goings-on at his site. You'll enjoy the Penalty Box Punishments and the rest of the SSL race coverage. Thanks to Zerin Dube, TheEastBayKid, Myke Toman, and a whole bunch of race team members for many of the photographs below.